So many parents are confused about their abilities of parenting that it is no wonder most parents don't even try to teach their child to read when their kids are 4, 5 and even 6 years old. I'm absolutely staggered by the research I conducted only to discover that so many parents simply see it as the teacher's job to teach their child to read. My question is why? "I can't teach my child to read," is the profound answer. What? Are you serious? You taught your child to crawl, walk, sit, eat, play, talk, look and listen. Now you're telling me that you can't do such a simple thing as teach your child to read? Come on! Where is your enthusiasm and those big plans you had before your baby was born? Let's say it together! I can teach my child. Yes, you can..... if I can teach my child, so can you! Let's look at 10 easy steps to teach your child to read. Step 1: Read to your child. Pick up a nice kid's book and sit down with your child and read out loud. Step 2: Reading to your child is not enough. You need to ask them questions. "Is this a big frog?" "No mummy, it's a big car." Presto.... your child has understood your question, is engaged listening to the story because the answer is correct. If wrong answer is given you know that your child is either not listening or is not comprehending what you are reading. So switch to an easier book or grab their attention by reading with more expression in your own voice. Don't sound boring. Yep... after step 2 comes step 3. Now it's time for you to be seen reading. What? Yes, you need to read. Books, magazines, newspapers.... your child needs to see you read in order for him to comprehend that hey, mum and dad read why can't I. Step 4 is the easy part and really fun. Point out letters (and numbers of course) anywhere and everywhere. Billboards, road signs, book labels, rego plates, advertising, posters.... no matter where you are, stop to point out letters and words. Hang the alphabet chart in your child's bedroom. Go through the letters every night before sleep time. Easy stuff, you don't need to be a wizard or have a PhD in education. Step 5: Write the letters in the sand, cut out numbers, glue words on a poster.... engage your child with hands-on activities that involve letters, numbers and words. As for step 6 what can I say! Stop being boring by reading the same story book for the twentieth time in a row. Read books that are fiction, non-fiction, nursery rhymes, songs, and quirky alphabet riddles. Always ask questions to make sure your child comprehends what is being read. No use if they just sit there, listen, be mute and then nod off to sleep dreaming about some pink elephant. Keep their brains active, stimulated by the excitement of your voice. A story can be as boring as all get out but it's your attitude, expression and overall approach to this which will make your child come up to you for more and more and more. An insatiable desire to want to hear and learn how to read all by themselves one day. Remember? I can teach my child.... keep saying it! Be confident! Okay so for step 7 it really is an extension to step 6. Rhyme is the best way to teach your child word families or if you want to use a fancy word; phonemic awareness. It simply means that you are teaching your child a pattern in reading. 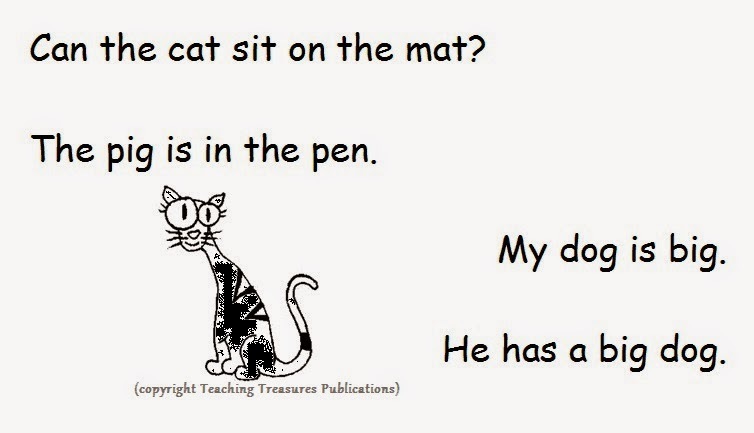 If your child can read cat, he should also be able to read hat, sat, mat, fat, rat.... are you getting the picture? Only one letter is changing here. Once your child is a little older you can do the same with four letter words. Let's say we change the word cat into chat, that, slat, flat, brat. To continue, let's quickly look at phonemic awareness and phonics. Everyone who reads uses phonemes which are the sounds we make when we speak the English language. It is made up of all the consonants and vowels. If you want your child to speak clearly then you must do the same. Your child will copy the sounds you make. The phonics method is probably the best known and widely used method to teach reading and writing in the English language. It relies on children being taught the alphabet first. They learn the names of the letters and the sounds they make. Once they have learnt the letter sounds they will begin to blend two letters together to make simple words then three letters, then four and so forth. Voila! You've just accomplished step 8 and 9. Last but not least; step 10. Start today and don't delay. If I can teach my child to read so can you. No better time to start than right now. Why delay the process of something that must be accomplished. Why not provide the platform for your child to succeed in their life? Only you have the power to get the ball rolling. Your child's teacher can only do so much. You can do more and help your child succeed. Step 10: enroll now in this eCourse and Teach Your Child to Read and Write. See you there! While more children continue to fall behind within the current education system many parents are getting seriously involved with their child's academic career. Parents are starting to see the benefit of giving their child a helping hand with learning to read. While it is a fact that some children can already read at the age of four most don't really get started until between the age of five and six. I believe there is nothing worse than comparing young children for their academic achievements because each child learns at a different rate. While it is also beneficial to do some comparisons between academic standards to ensure your child doesn't fall behind, make sure that you don't panic if your child still can't read at the age of six. Lots of children need just that little extra time and help to achieve the same results as their counterparts. Why? Like I said before, some children learn faster than others because I believe that some comprehend different learning methods faster than other learning methods. You can help your child though before they even attend school. You can teach reading and give your child the opportunity to start their academic career a lot sooner. Quite often kids will go to Kindergarten to learn the ABC's and basic words but are they actually teaching these or is it a glorified babysitting session! As a parent you can seize control of that very special moment when your child starts reading their first words and sentences and lay the foundation for a life of learning! If you want to seize that control then simply click through and enroll now to commence the 'Teach Your Child to Read' eCourse. This proven and tested course includes everything you need to teach your child. You do not need previous experience in teaching so sign up now and watch your child master each letter and continue to be amazed at how easy it is to teach basic reading and writing skills to your child! Copyright Teaching Treasures Publications. Simple theme. Theme images by pixhook. Powered by Blogger.